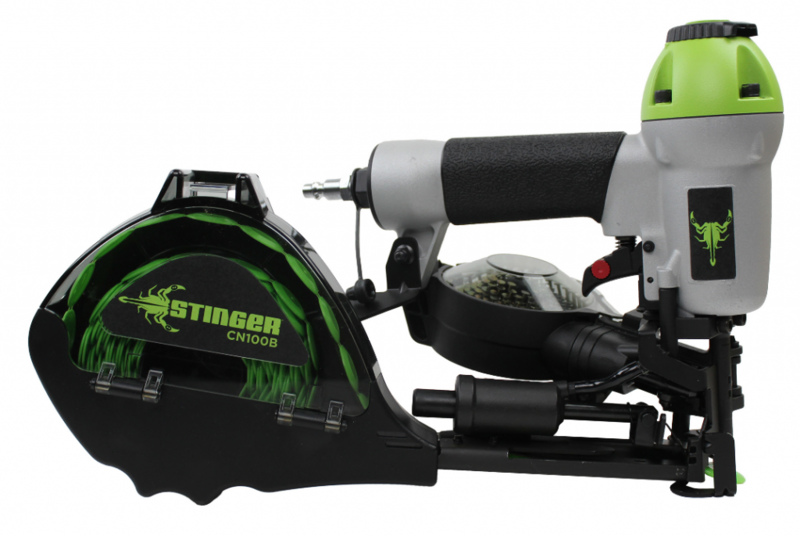 National Nail introduces the newly-enhanced STINGER CN100B Cap Nailer with an innovative design that improves performance with an improved cap magazine for added durability. The original CN100 is a recognized leader in time-saving roofing tools and part of the GAF Hire a Hero training program for military veterans. Lightweight at 4.9 lbs., STINGER’s CN100B features effortless loading, upgraded tool life, and utilizes full, one-inch collated plastic caps; it is capable of firing 200 caps/200 nails before reloading. The Electro Galvanized ring shank nails are 1” X .083” full round head. The STINGER CN100B also includes an installed belt hook, trigger with bumpfire and sequential modes, and durable carrying case. For more information, visit www.STINGERWORLD.com. PPG announced that the Nassau Veterans Memorial Coliseum in Uniondale, New York, which features PPG DURABRITE coating, has won a Chairman’s Award for design excellence from the Metal Construction Association (MCA). Built in 1972 and once home to the NHL’s New York Islanders and the NBA’s New York Nets, the 416,000 square-foot arena is newly wrapped in a futuristic metal shell composed of 4,700 individually folded and routed brushed aluminum fins enhanced by PPG Durabrite clear fluoropolymer coating. Based on high-performance fluoroethylene vinyl ether (FEVE) resins, PPG Durabrite coating is a direct-to-metal product specially formulated to extend and enrich the beauty of architectural metals by protecting them with a resilient, transparent clearcoat. The aluminum fins were fabricated by Sobotec Ltd. of Hamilton, Ontario, Canada, using 225,000 square feet of 4-millimeter ALUCOBOND PLUS aluminum composite material from 3A Composite USA in Davidson, North Carolina. The fins are anchored to the structure’s original concrete exterior via a custom-engineered structural attachment system by Sobotec. Using that system, Crown Corr, Inc., of Gary, Indiana, fitted the Alucobond fins into pre-fabricated metal frames and attached them to the building, which was painted black to emphasize the muted glow of the brushed aluminum. MCA judge Mark Dewalt said he appreciated the unique approach ShoP Architects and developer Forest City Ratner took to revive the building, which likely would have been torn down if not for the firms’ innovative design solution. The annual Chairman’s Awards recognize exceptional building projects involving MCA members. The awards are based on overall appearance, the significance of metal in the project, innovative use of metal and the role of metal in achieving project objectives. For more information, visit www.ppgmetalcoatings.com. To provide the roofing industry with the most comprehensive and up-to-date information about the design, materials and installation techniques applicable to architectural sheet-metal components, the National Roofing Contractors Association (NRCA) has released The NRCA Roofing Manual: Architectural Metal Flashing and Condensation and Air Leakage Control – 2018. The new volume updates the 2014 volume under the same title and serves as a reference for contractors, architects and roof consultants. 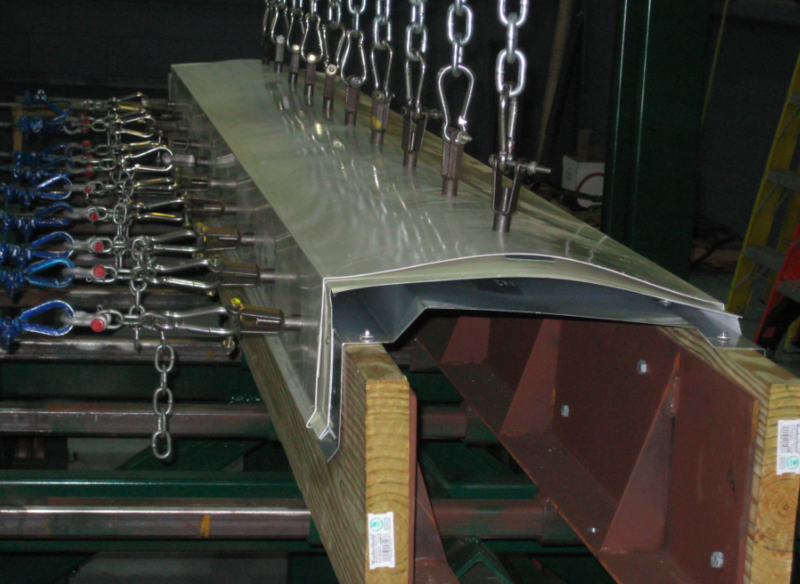 The manual contains information about the design, material and installation techniques applicable to architectural sheet-metal components and includes 60 construction details. 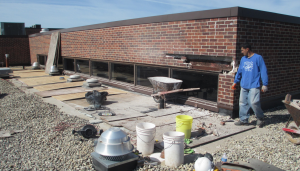 In addition, background information is provided on moisture and air leakage issues in buildings such as ventilation for steep-slope roof assemblies and condensation control for low-slope roof systems. The NRCA Roofing Manual: Architectural Metal Flashing and Condensation and Air Leakage Control – 2018 is best used with other volumes of The NRCA Roofing Manual: The NRCA Roofing Manual: Steep-slope Roof Systems – 2017, The NRCA Roofing Manual: Metal Panel and SPF Roof Systems – 2016; and The NRCA Roofing Manual: Membrane Roof Systems – 2015. The 2018 volume and boxed set can be purchased in hardbound versions or downloaded for free in electronic format to NRCA members at shop.nrca.net. RCI, Inc. is excited to announce the first ever RCI Canadian Building Envelope Technology Symposium. The symposium will take place September 13-14, 2018, at the Hilton Mississauga/Meadowvale, Mississauga, ON. We are now accepting abstracts for papers to be presented at the Canadian Building Envelope Technology Symposium. Abstracts of each paper (200 words) should be received at RCI headquarters by April 13, 2018. The RCI Canadian Building Envelope Technology Symposium Committee will review abstracts, and authors will be notified regarding acceptance of abstracts by April 20, 2018. If accepted, papers should be received by May 25, 2018, for peer review. Potential authors should contact Tina Hughes at RCI headquarters for a copy of the Abstract Submittal Form and RCI Guidelines for Presentations, complete directions on formatting, and acceptable formats for abstracts and papers. A topic description must be provided addressing the speaker’s subject knowledge and the level of knowledge that will be presented to the attendee (i.e., beginner, intermediate or advanced). Six RCI CEHs will be granted for an accepted paper. Additionally, presenters will earn triple credit for the length of the program (one presentation hour yields three CEHs). Download the 2018 RCI CBES Call for Abstracts PDF for more details. For more information, visit http://rci-online.org. The effect of high winds on roofs is a complex phenomenon, and inadequate wind uplift design is a common factor in roofing failures. Damage from wind events has historically been dramatic, and wind-induced roof failure is one of the major contributors to insurance claims. Roofing professionals have long recognized the importance of proper low-slope roof edge and gutter designs, particularly in high-wind conditions. For this reason, SPRI, the association representing sheet membrane and component suppliers to the commercial roofing industry, has spent more than a decade enhancing testing and design standards for these roofing details. SPRI introduced the first version of its landmark standard, ANSI/SPRI/ES-1 “Wind Design Standard for Edge Systems Used with Low Slope Roofing Systems” in 1998. Since then, the association has continually revised, re-designated and re-approved the document as an ANSI (American National Standards Institute) standard. Testing of edge securement per ANSI/SPRI ES-1 is required per the International Building Code (IBC), which has been adopted by every state in the country. 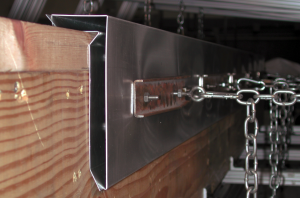 This standard provides the basic requirements for wind-load resistance design and testing for roof-edge securement, perimeter edge systems, and nailers. It also provides minimum edge system material thicknesses that lead to satisfactory flatness, and designs to minimize corrosion. Construction professionals have been successfully using the standard, along with the specifications and requirements of roofing membrane and edge system manufacturers to strengthen their wind designs. Until recently, the biggest news on the wind design front was the approval of ANSI/SPRI/FM 4435/ES-1, “Wind Design Standard for Edge Systems Used with Low-slope Roofing Systems.” Let’s call it “4435/ES-1” for short. SPRI knew recent post-hurricane investigations by the Roofing Industry Committee on Weather Issues (RICOWI) and investigations of losses by FM Global consistently showed that, in many cases, damage to a low-slope roof system during high-wind events begins when the edge of the assembly becomes disengaged from the building. Once this occurs, the components of the roof system (membrane, insulation, etc.) are exposed. Damage then propagates across the entire roof system by peeling of the roof membrane, insulation, or a combination of the two. 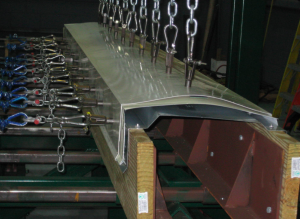 Recognizing that edge metal is a leading cause of roof failures, SPRI has redoubled its efforts to create a series of new and revised documents for ANSI approval. As has always been the case, ANSI endorsement is a critical step toward the ultimate goal of getting these design criteria included in the IBC. Roofing professionals understand that successful roof design requires the proper integration of a wide variety of roofing materials and components. For years, leading roofing manufacturers have taken a “systems” approach to their product lines. 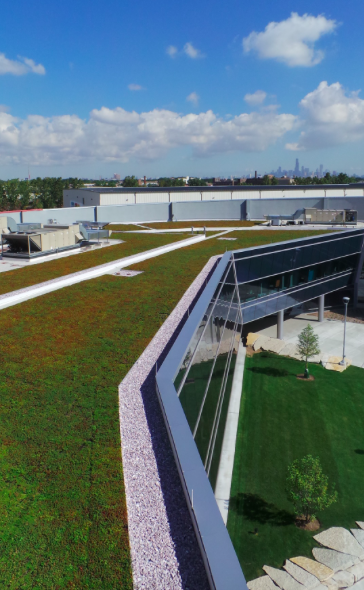 Recently, SPRI has zeroed in on the roof edge. Low-slope, metal perimeter edge details include fascia, coping and gutters, are critical systems that can strongly impact the long-term performance of single-ply roofs. 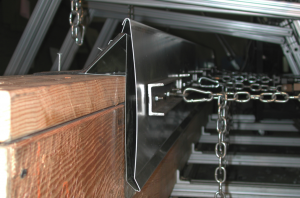 SPRI first addressed roof gutters in 2010 with the development of ANSI/SPRI GD-1. The testing component of this document was recently separated out to create a test standard and a design standard. The test standard, GT-1, “Test Standard for Gutter Systems,” which was approved as an American National Standard on May 25, 2016. Similarly, SPRI has revised 4435/ES-1 to only be a test standard. Making both edge standards (4435/ES-1 and GT-1) into standalone testing documents makes it easier for designers, contractors and building code officials to reference the testing requirements needed for metal roof edge systems. IBC requires that perimeter edge metal fascia and coping (excluding gutters), be tested per the three test methods, referred to as RE-1, RE-2 and RE-3 in the ES-1 standard. The design elements of ES-1 were never referenced in code, which caused some confusion as to how ES-1 was to be applied. The latest version of 4435/ES-1 (2017) only includes the tests referenced in code to eliminate that confusion. Test methods in 4435/ES-1 2017 have the same names (RE-1, RE-2, and RE-3), and use the same test method as 4435/ES-1 2011. Because there are no changes to the test methods, any edge system tested to the 2011 version would not need to be retested using the 2017 version. FM Global’s input was instrumental in the changes in 2011 when ANSI/SPRI ES-1 incorporated components of FM 4435 to become 4435/ES-1. However, there are no additional FM related changes in the latest 4435/ES-1 standard. With 4435/ES-1 becoming a test standard for coping and fascia only, and GT-1 being a test standard for gutters, SPRI determined that a separate edge design standard was needed. Meet ED-1, a design standard for metal perimeter edge systems. The design portions of the ES-1 edge and the GD-1 gutter standards have been combined and are now referenced by SPRI as ED-1. It has been developed and is currently being canvassed as an ANSI standard that will provide guidance for designing all perimeter edge metal including fascia, coping, and gutters. ED-1 will be canvassed per the ANSI process later this year. However, SPRI is not planning to submit ED-1 for code approval. Load to be required by the Authorities Having Jurisdiction (AHJ). Tables similar to those included in 4435/ES-1 will be included for reference. If this sounds a tad complex, imagine the design work required by the dedicated members of SPRI’s various subcommittees. The GT-1 standard is the newest, so let’s tackle this one first. As noted above, the ANSI/SPRI GT-1 test standard was developed by SPRI and received ANSI Approval in May of 2016. Testing of roof gutters is not currently required by IBC; however, field observations of numerous gutter failures in moderate to high winds, along with investigations by RICOWI following hurricanes have shown that improperly designed or installed gutters frequently fail in high wind events. GT-1 provides a test method that can be used by manufacturers of gutters, including contractors that brake or roll-form gutters, to determine if the gutter will resist wind design loads. Installing gutters tested to resist anticipated wind forces can give contractors peace of mind, and may provide a competitive advantage when presented to the building owner. 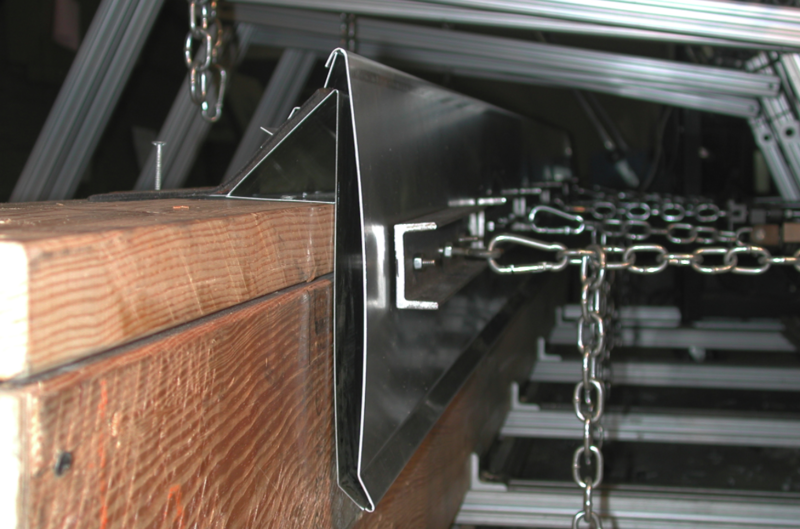 GT-1 tests full size and length samples (maximum 12 feet 0 inches) of gutter with brackets, straps, and fasteners installed per the gutter design. It is critical that the gutter be installed with the same brackets, straps, and fasteners, at the same spacing and locations as per the tested design to assure the gutter will perform in the field as tested. The fabricator should also label the gutter and/or provide documentation that the gutter system has been tested per GT-1 to resist the design loads required. GT-1 consists primarily of three test methods (G-1, G-2, and G-3). Test method G-1 tests the resistance to wind loads acting outwardly on the face of the gutter, and G-2 tests the resistance to wind loads acting upwardly on the bottom of the gutter. G-3 tests resistance to the loads of ice and water acting downwardly on the bottom of the gutter. Tests G-1 and G-2 are cycled (load, relax, increase load) tests to failure in both the original GD-1 standard and the new GT-1. The only change being that in GD-1 the loads are increased in increments of 10 lbf/ft2 (pound force per square foot) from 0 to failure, and in GT-1 they are increased in increments of 15 lbs/lf (pounds per linear foot) from 0 to 60 lbs/lf, then in 5 lbs/lf increments from above 60 lbs/lf to failure. Note also that the units changed from lbf/ft2 (pound force per square foot) to lbs/lf (pounds per linear foot), which was done so that the tests could be run using the test apparatus loads without having to convert to pressures. 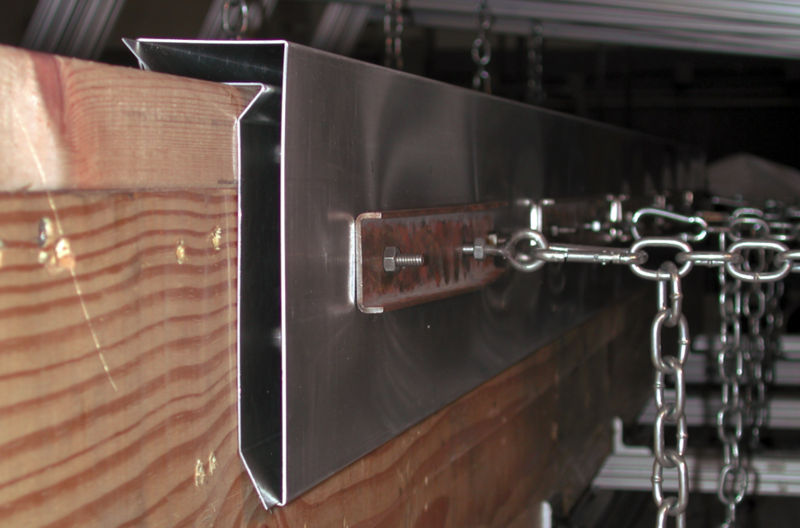 The GT-1 standard specifies a laboratory method for static testing external gutters. However, testing of gutters with a circular cross-section is not addressed in the standard, nor does the standard address water removal or the water-carrying capability of the gutter. In addition, downspouts and leaders are not included in the scope of the standard. SPRI intends to submit ANSI/SPRI GT-1 for adoption in the next IBC code cycle. 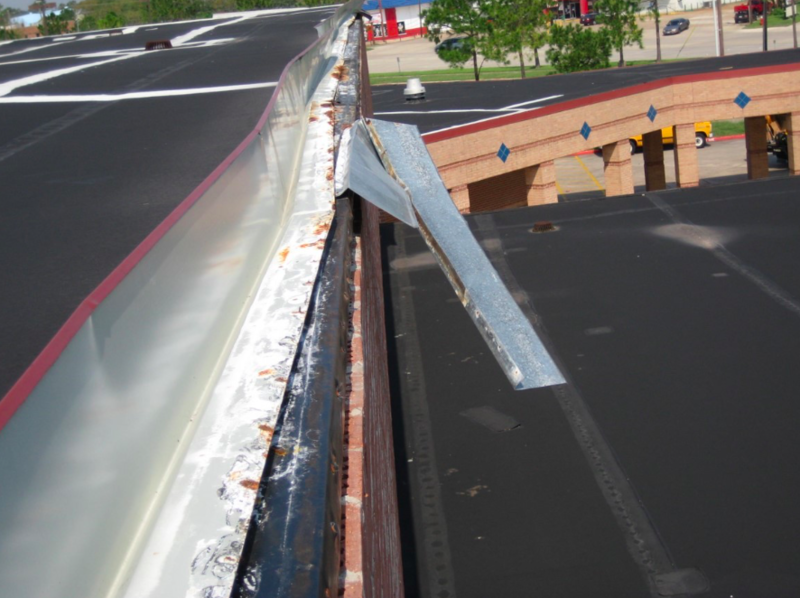 As referenced above, IBC requires that perimeter edge metal (fascia and coping), excluding gutters, be tested per three test methods, referred to as RE-1, RE-2 and RE-3 in the ES-1 standard. RE-1 tests the ability of the edge to secure a billowing membrane, and is only required for mechanically attached or ballasted membrane roof systems when there is no peel stop (seam plate or fasteners within 12 inches of the roof edge). RE-2 tests the outward pull for the horizontal face of an edge device. RE-3 tests upward and outward simultaneous pull on the horizontal and vertical sides of a parapet coping cap. All versions of ANSI/SPRI ES-1 and ANSI/SPRI GD-1, the 2011 version of ANSI/SPRI 4435/ES-1, and the new ED-1 standard all provide design information for calculating roof edge design pressures. These design calculations are based on ASCE7 (2005 and earlier), and consider the wind speed, building height, building exposure (terrain), and building use. However, as stated above, IBC requires that the load calculation be per Chapter 16 of code, so the SPRI design standards are intended only as a reference for designers, fabricators, and installers of metal roof edge systems. ES-1-tested edge metal is currently available from pre-manufactured suppliers, membrane manufacturers and metal fabricators that have tested their products at an approved laboratory. The roofing contractor can also shop-fabricate edge metal, as long as the final product is tested by an approved testing service. The National Roofing Contractors Association (NRCA) has performed lab testing and maintains a certification listing for specific edge metal flashings using Intertek Testing Services, N.A. Visit www. nrca.net/rp/technical/details/files/its details.pdf for further details. A list of shop fabricators that have obtained a sub-listing from NRCA to fabricate the tested edge metal products are also available at www. nrca.net/rp/technical/details/files/its details/authfab.aspx. As far back as 1998, SPRI broke ground with its ANSI/SPRI/ES-1 document addressing design and testing of low-slope perimeter edge metal. 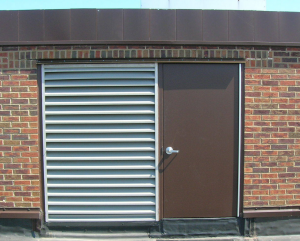 Today, the trade association has a variety of design documents at the roofing professional’s disposal, and is working to get ED-1 approved as an Edge Design Standard to be used for low-slope metal perimeter edge components that include fascia, coping and gutters. All current and previously approved ANSI/SPRI standards can be accessed directly by visiting https://www.spri.org/publications/policy.htm. For more information about SPRI and its activities, visit www.spri.org or contact the association at info@spri.org. The American Institute of Architects (AIA) has issued the following statement on the election of Donald Trump as President of the United States, as well as the incoming 115th Congress. “The AIA and its 89,000 members are committed to working with President-elect Trump to address the issues our country faces, particularly strengthening the nation’s aging infrastructure. During the campaign, President-elect Trump called for committing at least $500 billion to infrastructure spending over five years. We stand ready to work with him and with the incoming 115th Congress to ensure that investments in schools, hospitals and other public infrastructure continue to be a priority,” states AIA Chief Executive Officer Robert Ivy, FAIA. PHOTO 1: The new roof has been installed at SD 73 Middle School North and it can clearly be seen that the door and louver need to be raised. On this project, there were four such conditions. The most common concern I hear related to increasing insulation thickness (a result of increased thermal values of tapered insulation), especially in regard to roofing removal and replacement, is, “OMG! What about the roof access door and/or clerestory?” You can also include, for those knowledgeable enough to consider it, existing through-wall flashing systems and weeps. I’m a bit taken aback by this concern; I have been dealing with roof access doors and clerestory sills for the past 30 years and, for the most part, have had no problems. My first thought is that roof system designers are now being forced to take these conditions seriously. This is a big deal! They just have no clue. In the next few pages, I’ll review several possible solutions to these dilemmas, provide some detailing suggestions and give you, the designer, some confidence to make these design and detailing solutions. For the purpose of this article, I will assume reroofing scenarios where the challenge is the greatest because the conditions requiring modification are existing. For many and perhaps most contractors who sell and, dare I say, design roofs, it is the perceived “large” expense of modifying existing conditions that is most daunting. Often, these conditions are not recognized until the door sill is several inches below the new roof sur- face. Not a good predicament. Planning for and incorporating such details into the roof system design will go a long way to minimizing costs, easing coordination and bringing less tension to a project. PHOTO 2: The sill has been raised and new hollow metal door, frame and louver have been installed at SD 73 Middle School North. Door sill and louver sill flashing are yet to be installed, as are protective rubber roof pavers. Door access to the roof is the easiest method to access a roof. 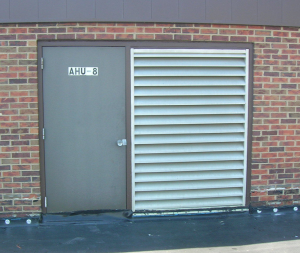 These doors are typically off a stair tower or mechanical penthouse and most often less than 12 inches above the existing roof as foresight was not often provided (see photos 1, 2 and 6 through 9). With tapered insulation thickness easily exceeding 12 inches, one can see that door sills can be issues with new roof systems and need to be considered. Designers should first assess the condition of the door and frame, typically hollow metal. Doors and frames that are heavily rusted should not be modified and reused, but discarded, and new ones should be specified. The hardware too needs to be assessed: Are the hinges free of corrosion and distortion? Is the closure still in use or detached and hanging off the door frame? The condition of door sweeps, knobs, lockset and weather stripping should also be determined. Ninety-nine percent of the time it is prudent to replace these parts. As the roof system design develops, the designer should start to get a feel for the thickness of insulation at the door. It is very important the designer also consider the thicknesses that vapor retarders, bead and spray-foam adhesives, cover and board and protective pavers will add. These can easily be an additional 4 inches. PHOTO 3A: The new roofing at SD 73 Elementary North was encroaching on this clerestory sill and required that it be raised. As part of this project, the steel lintel was exposed. It was prepped, primed and painted and new through-wall flashing was installed. Once the sill height is determined, the design of the sill, door and frame can commence. If the sill height to be raised is small—1 1/2 to 3 inches—it can often be raised with wood blocking cut to fit the hollow metal frame, flashed with the roofing membrane, metal sill flashing and a new door threshold installed, and the door and frame painted. This will, of course, require the removal of the existing threshold and door which will need to be cut down to fit and then bottom-sealed with a new metal closure (see details A and B, page 3). When the door sill needs to be raised above 3 inches, the design and door considerations increase. Let’s consider that the door and frame is set into a masonry wall of face brick with CMU backup. Although most hollow metal doors are 7 feet 2 inches to match masonry coursing, after the modification the door may be shorter. For example, if a door is 7 feet 2 inches and you must raise the sill 5 inches, the new door and frame will need to be 6 foot 9 inches. PHOTOS & ILLUSTRATIONS: Hutchinson Design Group Ltd.
ASTM International Committee E60 on Sustainability is seeking participation through presentations and papers for the Symposium on Balancing Resiliency, Safety, and Sustainability in New Orleans, Louisiana, in conjunction with the committee’s standard development meetings. Potential participants must submit an online 250 – 300 word Preliminary Abstract Form by January 13, 2017. Please email Hannah Sparks (hsparks@astm.org) to confirm your submission. For more information on the symposium, contact chairmen Emily Lorenz (elorenz@pci.org) and Walter Rossiter, Jr. (wjrossiter@verizon.net). To submit a preliminary abstract form visit http://www.astm.org/E60CFP2017. FORTIFIED Home On the Go interactive tablet app gives information to strengthen homes against natural disasters. The Insurance Institute for Business & Home Safety (IBHS) and Munich Re, US launches an interactive tablet app to help builders, contractors, architects and homeowners design and build structures in the face of increasing severe weather events. FORTIFIED Home On the Go interactive tablet app is available for free download from the iTunes Store. It walks homeowners, contractors and architects through the steps for strengthening homes. The information includes videos, animations and technical specifications for retrofitting or building single family homes. Information in the app is taken from IBHS’ FORTIFIED Home program, which provides a set of building standards for homes in high-risk areas, such as in the plains and coastal states.